In an arduous journey through space, a group of queer-femme cosmonauts fight their way to Mars to establish a new colony. With a million humans in cryostasis, the human race is at risk of extinction, and only you can save it. As a cosmonaut on this mission, you and your comrades communicate together to dodge the space debris, comets and say “Give me your worst, galaxy”. As a cluster of ships, you work together to guide yourself through the unforgiving space landscape. This is the premise of To Space, Comrade!, an arcade game with a mission to encourage and establish progressive queer and communist themes in a ’80s 16-bit format. “I wanted to make the game as gay as possible and as femme-centric as possible.” says the captain and engineer, Josie Cordova, who built the game from scratch, teaching themselves how to do it along the way. 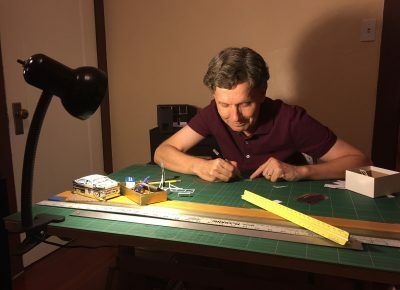 Cordova has always been drawn toward the mechanics of things—more specifically, building things such as drone synths and guitar pedals for their own music projects. From there, Cordova developed skills in coding, which eventually led to the budding of this now fully fleshed out arcade game. In the beginning stages of developing the game, Cordova used a method called cellular automata. The way they explain this method is using ants as an example: Ants have simple rules that govern their behavior—they eat, climb on stuff and carry things back to their colony. When using cellular automata, you put a collection of “ants” together in a system, and their behavior affects each other creating rich emergent behavior. “One of the things that has always been important to me as an artist is creating things that can create,” Cordova says. In the game, none of the outcomes are the same. The game is designed to behave at random and create unique outcomes that will never be repeated—Cordova built the system to turn out unpredictable output, making for a different experience every time. The cabinet was made by repurposing an old arcade game. With the help of Cordova’s arcade mentor (and local musician), David Payne, Cordova was able to add the finishing touches to the game. Payne’s role in the development of the game is crucial. “Had I not met Dave, this game would not be in a cabinet right now,” Cordova says. Cordova met Payne through playing shows with him for their project Future Coochie at Twilite Lounge, the same place Cordova would later debut the game. Payne assisted in areas like financing the game, finding the cabinet, moving the game from place to place and fabrication for the custom controls. The night that Cordova unveiled To Space, Comrade! I was sitting in the back of Twilite Lounge. A typical night out at the bar developed into an experience that both inspired and struck the audience. Cordova talked about their journey through the development of the game, the learning, the sacrifice, the successes and the challenges. They then shared with the audience that their grandfather had passed away that same morning, and such determination and conviction to still debut their game illustrated just how important this accomplishment is to Cordova. To Space, Comrade! currently resides at Diabolical Records and is predicted to float around from place to place in the future. 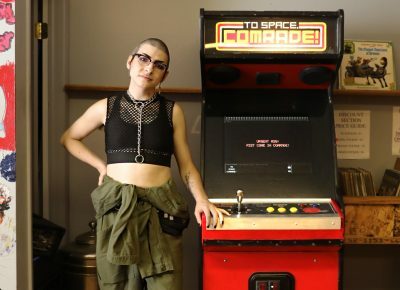 You can learn more about Cordova’s first arcade game on their website mothbuilt.squarespace.com/to-space-comrade, and you can support their patreon at patreon.com/josiedrew. October’s Localized acts are here to inspirit you to get your hands up and your feet onto the dance floor. The night will kick off with Marina Marqueza’s serene performance, followed by a heavy dose of atmosphere created by Alyxandri Jupiter’s spacey brand of electronica-fused hip-hop. Freemind Movement will open your third eye with the introspective and conscious bars packaged in classic hip-hop fashion. SLUG Localized is a free monthly showcase of local music sponsored by Uinta Brewing, High West Distillery, KRCL 90.9FM and Spilt Ink SLC. In the grand scheme of hip-hop as a genre, it seems that a lot of individuals think that it has fallen to the wayside of lean sippin’, face-tattooed kids who don’t annunciate when they speak—but this blanket view on the genre couldn’t be further from the truth. 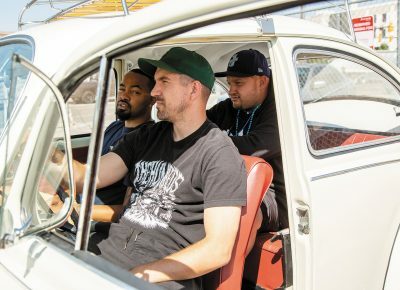 Salt Lake City hip-hop group Freemind Movement stay true to their name with their brand of conscious and insightful bars over a more traditional styles of production and instrumentation. Their last release, Saint Villian, was their way to disrupt the digital age with tracks that speak to government corruption as well as to themes of life and mortality. Freemind Movement’s sound could be summed up by saying they channel what resonates strongest from classic hip-hop. Add a dash of modern touches such as elements of trap, and Freemind Movement creates original sound for the modern hip-hop listener. Freemind Movement are able to mesh all of these styles and themes together with the benefits of having three different points of view from their members. SUUNDAii (Marcus Baker) is a Southern California native who originally grew up not being allowed to listen to hip-hop until he was shown Common’s Like Water for Chocolate by a school friend. SUNDAii thinks of his place in the group as the wildcard. “Seeing that I rap and sing, I’m always looking for ways to push the envelope all in the name of art, definitely the free spirit of the group,” SUNDAii says about his place in Freemind Movement. Mycon (Bryan Anderson) adds a bit more stability to the group acting as the “rational one.” “We call him ‘the brain,’” SUNDAii says. “He hears things most people don’t, and when he raps, it’s like listening to a poet.” Mycon grew up in a household full of music, with punk and hip-hop resonating with him most. “My mom sang and played piano, and my siblings played instruments,” he says. Mycon lives up to his reputation as “The Brain,” keeping his finger on the pulse of hiphop and looking out for new artists and styles. “I was/am always on the hunt for under-discovered artists who take risks and approach their music unconventionally,” Mycon says about his taste in music and hip-hop in particular. The final member of Freemind Movement is Imij (Jim Benedict), known in the group as the “Frontline Solider.” “Imij’s style is very smooth, and he has a knack for stringing sentences together,” Mycon says. Imij grew up wanting a be a musician, was influenced by his father and rapped with his brother in high school. Talking with Freemind Movement, I get a sense of how in sync they are with one another. That connection has been there since before Freemind Movement was a thought. “Mycon and Imij were already in a group (Broken Silence), and when I first moved out here from California, we linked up, made a couple of songs and decided we were on to something good,” SUNDAii says. “It’s been the movement ever since.” After deciding that their chemistry was apparent, they made their group official and released their first single in 2016. Their process in creating new music stems from this organic bond these three have created. Mycon says of their creative process, “We try to keep the core part of our process the same every time—it’s what happened in the beginning naturally, and it still gives us our most authentic approach to new projects. It starts with a concept or a new instrumental, then someone will write something and share it with the group.” From there, the group will harness the momentum that carries their energy through the track and their lyrics. Freemind Movement is up for a busy few months, with SUNDAii releasing a solo album, Freemind Movement being in the later stages of releasing their album Phases (due to drop mid-November) and killing the stage at SLUG’s Localized at Urban Lounge on Oct. 24. Come check out some of the best hip-hop SLC has to offer. Keep in touch with Freemind Movement by following the group and its members: On Instagram @freemindmvmt is: Bryan Anderson, “Mycon” (@mroneup); Marcus Baker, “Sundaii” (@sundaii_); and Jim Benedict, “Imij” (@imij435). This October, Plan-B Theater will debut a moving one-man performance of the trials and tribulations of queer identity and Mormon faith. Matthew Greene’s Good Standing is a creative take on the traditional, single-performer method with an unusual set design, intensely personal character portrayal and a story with roots that run deep for its collaborators and community. Set designer Keven Myhre, actor Austin Archer and Greene herald Good Standing as a play with multidimensional storytelling. The play’s origin came from the struggles of its storyteller, Matthew Greene. During his time at BYU and amid the rancor of Proposition 8, Greene penned Adam & Steve and The Empty Sea, a tale of struggle between two friends navigating Mormon and gay issues. After debuting with Plan B—and catalyzing some academic and emotional turmoil—Greene acknowledged that the tale he was telling was his own. Good Standing is Greene’s post-revolution perspective on his internal battle through the filter of dramaturgy. “This play could really give audience members an opportunity to examine the influences that unite and divide us along lines of faith, family, tribe and orthodoxy.The central problem is universal: How do we fare in our quest for connection?” Greene says. His consideration of his characters and audience shines through in the deep well of contemplation that he has imparted to the impact of the piece. “Good Standing is definitely the most autobiographical play I’ve ever written. I grew up as a gay Mormon and struggled to fit into a community that, ultimately, I came to believe didn’t have a place for me. I was the proverbial square peg desperately trying to fit into a round hole and damaging myself in the process. The main character’s story is a lot like mine … His struggles are the same ones that plague me and my now-distant relationship with the Mormon church. Curtis knows, as do I, that he is a product of this community, that he’ll never be able to disconnect, but that he’ll never feel fully at home among the men who now sit in judgment,” Greene says. Good Standing comes at a culturally charged time for many Utahns navigating faith and LGBTQ+ issues. Myhre says, “In our current societal climate, I’m quite certain audiences will be able to relate to the themes of religion influencing familial relationships.” Good Standing will run from Oct. 18–28 with Plan-B Theater Company. Visit planbtheatre.org/goodstanding for tickets and information. Out of all of the artists I’ve talked to over the years, none have been more ingrained in their particular style of music like Alyxandri Jupiter. Her space-themed blend of electronica and hip-hop sparked at the time she was born. 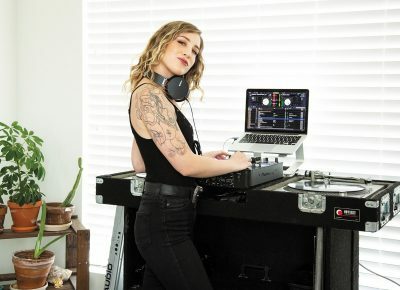 Her father, Chris Wright, is a DJ in the drum and bass scene here in Salt Lake City. Alyxandri says, “He had a lot of gigs out in the desert or warehouse raves. My mom would bring me to a few of the camping raves so I could listen to ‘Daddy’s funky music,’ as I would call it. I was a bass-lover ever since I can remember!” This early influence shines in Jupiter’s latest release, Out of Body Experience, a four-track EP featuring an atmospheric blend of whirling beats and cool-calm vocals. Jupiter’s pursuit of a career in music would take some time to come to fruition, especially as she moved to Hawaii. While there, she had a good setup for performing and started her own dance company. Due to the size of the Big Island, she felt that there wasn’t a lot of room or opportunity to grow. Jupiter’s decision to come back to Utah and pursue music came is a sort of spiritual sign. Jupiter says, “I was thinking about moving back to SLC to really give this music-career thing a chance. Right then a giant, white pueo [Hawaiian owl] flew at my window, spread its wings and looked me straight in the eye. It happened so fast, but it’s like time just stopped. We both agreed that it was a sign. That night, I looked at my amakua [spirit animal] tarot cards for the pueo meaning. Right there in front of me, it said, ‘If you’ve been neglecting a certain skill set or ability, you need to act now, or you are in danger of losing that.” Seemingly writing in the stars, Jupiter took that sign and bought a plane ticket back to Utah, where she was able to allow her career to open up more and join the Salt Lake City scene. Localized has always stood as an amazing platform to showcase Utah’s local music scene, and from making the move back to Utah, Jupiter seems to embody the spirit that Localized celebrates month after month. Alyxandri is bound to bring something exciting to the table, so expect to hear high-caliber and high-quality house/ electronica/hip-hop at SLUG’s Localized at Urban Lounge on Oct. 24. A self-described “boutique agency,” local design firm Hint Creative thrives in small, personal environments. The number of full-time employees hovers around a dozen, and their office space is one room with a row of computers and a few private meeting rooms. When I go to speak with them, I speak to Hint’s two Art Directors, Analisa Estrada and Cinthya Lopez, as well as the founder and Creative Director Christian Hansen. The professional and creative relationship that the team has cultivated is readily apparent. They share mentors and education programs, and there seems to be little tension between Hansen’s descriptions of the big-picture workings and Estrada’s and Lopez’s take on the specifics of projects and campaigns. Even though Hint’s appearance is small, the scope of work is massive. They’ve designed for big-name companies like Nike, Fender and DC Shoes, as well as the Utah-based retailers such as Skullcandy, Backcountry and Cotopaxi. While these high-profile brands give Hint the credibility of a national design firm, they still exist within the world of Utah-based design. On top of helping with branding for local charitable organizations More2Life and 5 for the Fight (Hint helped design the sponsor logo on the Utah Jazz uniform), Hansen’s former position as President of the Salt Lake section of AIGA keeps Hint tied to the local design community and the annual Design Week. All this is not to diminish the role creativity plays in Hint’s work. Looking at some of the firm’s past work, particularly their recent brand campaign with San Diego–based distillery You and Yours, Hint’s work displays an elegant vibrancy. “We do have a common aesthetic,” says Hansen. “That’s why we’re in alignment as a studio. But, it’s based on foundational things like simplicity and problem-solving.” There’s never a sense in Hint’s work that the individual artist’s taste are dominating the project. Rather, the core tenets of the team’s shared understandings are easily mutated and molded to fit the clients’ needs. Unlike other design firms—especially larger ones—Hint is dedicated to client collaboration and a highly visible creative process. The clients participate in workshopping, frequent check-ins and the making of mood boards to help ensure that there’s total communication on both ends of the project. 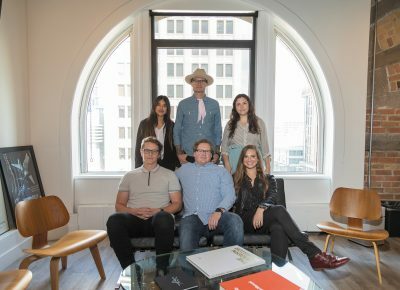 “We have a philosophy here of connecting regularly with the client,” says Hansen. “We show them more behind-the-scenes work and we really try to integrate them in the creative process.” While Hansen jokes that this means the client is equally guilty if they’re unsatisfied, Estrada is quick to clarify: “On the positive end, [the client feels] ownership over the final product.” One key aspect of this is what Hint calls a brand’s “north star,” a term that each members returns to frequently. It refers to the essence of a brand’s focus, audience and appearance. Everything that Hint does revolves around this north star, and it informs each step of their creative process. The boutique nature of Hint certainly keeps everyone in the office busy. Hansen comes to our conversation after a long meeting, and Lopez leaves early to finish up some work before the end of the day. Around me, the rest of the staff remains busy with phone calls, inter-office meetings and logistical work. Even though it’s after 5 on a Friday, the Hint team is ever-active. Because of the discrepancy between how much work needs to be done and how much the small Hint team can humanly accomplish, the team is adept at taking a much-needed step: accepting when you need some extra hands. “It’s a way to be a little more nimble,” says Hansen. “We like the idea of being boutique, putting the emphasis on art direction and flexing with our Partner Services when our client needs it.” Depending on the scope of the project, Hint will bring in strategy consultants, copywriters and outside photographers to help finalize a project. At this aspect’s most extreme, some campaigns result in upwards of 40 people receiving a paycheck. While the three team members I speak with note that a lot of their work with the bigger, more recognizable brands is moving further into the past—save a recent revamp of the websites for The Grand America and The Little America—there’s plenty on the horizon for Hint. For trust and market unveiling purposes, the firm has asked that specifics remain under wraps, but the following year for Hint will be as fruitful as ever. To find some of their past work and to inquire about enlisting Hint’s services, head to their website (which is, of course, sleek and stunning): hintcreative.com. Salt Lake City is quickly becoming a destination for the tech industry and graphic design. With companies like Adobe setting up shop in Utah, the creativity around Salt Lake City has been elevated. Here, two notable SLC creatives, Adobe Senior Graphic Designer Alan Peck and Adobe Senior Art Designer and AIGA SLC President Kassie Scribner discuss their lives in the design world and the intricacies of their respective hobbies: woodworking and embroidery. As a child, Kassie Scribner learned embroidery from her grandmother, a hobby she eventually returned to as an adult. “I loved the time I got to spend learning from [my grandmother], and when I found that embroidery allowed me to blend lettering and illustration … I was hooked,” she says. For Scribner, her work at Adobe is a striking contrast from the simplicity of embroidery, but it’s a difference she embraces. “I get to work at the company that created the software I’ve used since I was 13 years old, building web pages and marketing content, [working] with some of the most brilliant and hardworking people. 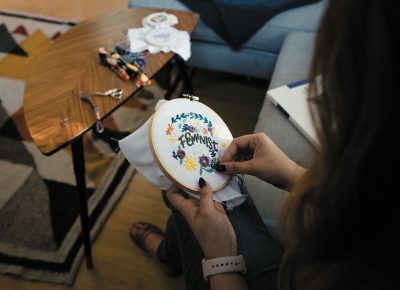 My embroidery is so lo-fi that I get to nearly never look at a computer screen, and I am able to do something that is basically for me,” she says. It’s a simple effect that conjures complex questions, art that challenges the viewer’s conception of its base parts. What makes a mask? What happens to the self when you wear a mask? What sort of masks do we put on others, often without realizing? It’s a flexible metaphor during a time when the concept of the “other” is invoked in daily discourse. Though Jahn uses all kinds of media to explore the concept, her photography pieces are the most striking. “The Sentinel” depicts the profile of a person wearing one of Jahn’s masks, and the effect of their construction is apparent: This particular mask hangs off the person like a helm, cascading down layered pieces of shiny material. These masks are mirrors in the sense that they reflect, but they are not strictly utilitarian in the sense of, say, a bathroom mirror. They distort reality before ever claiming to report on reality. So the experience of looking at a subject, then, is often a process of reconciling what’s literally in the frame of the picture with what’s reflected, sometimes two wildly different images. That reconciliation is where the work of seeing one’s self in the other—and vice versa—really happens. In “The Sentinel,” it’s difficult to focus on the face and the reflection at the same time. Both contrast harshly, despite this being one of the few masks that doesn’t completely obscure the subject’s face. You get the sense that if the person were moving—were it not a still photograph—it might make you nauseous. The colors and world reflected are more dazzling and alluring than our usual perception allows for. Each image grabs parts of the sky and clouds, the brown and earthy land, and even an intense, otherworldly red. Combined with the slight visage of the person wearing the mask, I found myself moving between a feeling of being grounded in and estranged from my own perception. This world-distortion is probably the most basic way in which the masks give us a sense of the other. The composition of each piece also contributes. “The Source” depicts someone wearing another mask with black, hair-like strands that are splaying out as the person pushes their fists together. The piece is set in a great, white hall, so the mask does little to warp its muted surroundings. More prevalent, is the particular way that Jahn invokes the sense of Greek and Asian rituals she cites as inspiration for the exhibition. These ceremonies focus on transition between life and death, often as a metaphor for stages of adulthood. “The masks transform the individual and segue them into the next state of life,” Jahn says. That “next state” may not be a higher rung on a progressive chain, either. “The Source” probably argues this best as the mask-bearer looks to be older yet still experiencing a moment of transformation. In 2018, the ubiquity of screens and mirrors causes its own kind of reflection, a practice that reinforces its own fascination. “I think it’s baked into the Western subconscious,” Jahn says, “the idea of self-reflection, conflating visage with essence. I’ve always been interested in mirrors and, in undergrad, wrote a paper about Rembrandt and Velazquez’s use of mirrors in self-portraiture. I’m interested in modes of looking and what this says about culture.” MIRROR | MASK is a good representation of the way that Jahn likes to create works unbounded by any specific concept or medium. “I work between both,” she says. “I love sewing. I also love filmmaking and holding the camera … voiceovers and set design … making silkscreens and doing digital works.” The list of interests goes on, and you can even see and wear some of the masks she made as part of the exhibition. 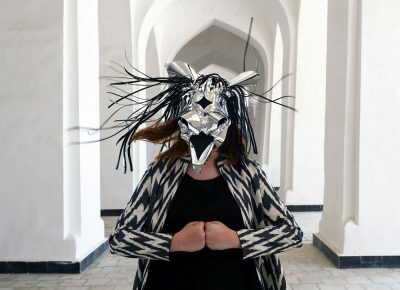 MIRROR | MASK runs at the UMFA from August 16 to December 9. You can plan a visit at umfa.utah.edu. Design is all around us. Some of it is loud—a lot of it is subtle, whether it be the way a building is framed within the skyline from a particular point of view to the brightly colored, often contrasting signs promoting incumbents and their challengers each fall. 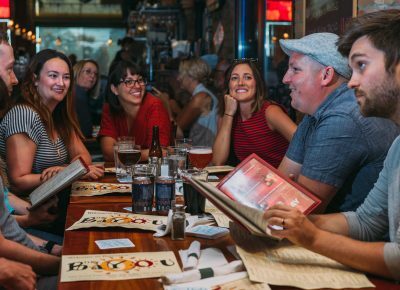 It is also by design that a group of originators belonging to the Salt Lake Chapter of AIGA decided to bring as many people with a knack for or an interest in design together regularly. Cocktails with Creatives is a free, monthly networking event for anyone wanting to come out and meet other people who are involved in some type of design. The event takes place every third Thursday of the month. In Sept, the group, led by AIGA’s Vice President of Programming, Jim Killian, will be meeting at The Bayou on the 20th at 7p.m. The following Cocktails for Creatives will be on Oct 5 and Nov 15. Killian hopes anyone wanting to meet like-minded creatives to attend. “It’s not just for designers but other creatives, too, people who like creative stuff,” Killian said “So if people are interested at all, if they want to hang out with creative people, they should just show up.” Five years ago, members of the AIGA’s board realized that there were a lot of different types of creativity in Salt Lake Valley and decided that a support system for people so inclined was a good idea. After some planning and discussion, the notion of gathering monthly to find common ground took shape and the event was launched. “You know, people are constantly moving here for jobs, and the only thing they know is AIGA because there was an AIGA where they’re coming from,” Killian says. Killian, who has been a member of AIGA for 12 years and has served in various capacities on the board, has been handling Cocktails with Creatives for about a year and loves that the event always brings fresh faces into the design folds of Salt Lake City. Each month, 20–40 people attend the event, many of whom have never been, whether they are new to the design game entirely or someone with years of experience just getting involved. “You think Salt Lake’s a pretty small town for designers, but every time we go, there are a lot of new people,” Killian says. Design is not limited to the things most people associate it with, either. According to Killian, one can find landscape designers, architects, fashion designers or illustrators among the monthly crowd. There are people there representing large corporations as well as small-business owners, and people at every level of experience imaginable. Many of the introductory handshakes at Cocktails with Creatives lead to partnerships or future collaborations. “For me, personally, I run my own business and I meet people all the time and we end up working together on a project. It’s invaluable,” Killian says. AIGA is also heavily involved with Salt Lake Design Week, which has been taking place Oct 1–5 this year. Design Week is in its eighth year and has consistently shown growth since the beginning. It was started by AIGA’s board, and many of the charter’s members volunteer and facilitate activities each year. The week consists of workshops, nightly meetups, phenomenal guest speakers and a fashion show. There is truly something for everyone—so many interests and mediums are represented that anyone can get something of value by taking part in some of the events planned. Design Week is like a large-scale version of Cocktails with Creatives, in that it serves to enlighten and inspire anybody who attends. It’s a time of year when people can receive feedback on what they are working on, or catch the spark needed to ignite the beginning of something new. Design Week is coming and a great way to get stoked up is Cocktails for Creatives. According to Killian, the best way people can get involved in a particular area is to get out and meet other people who are doing things that appeal to them. AIGA’s monthly gathering is a great place for such meetings, as well as any of the events going on during Design Week. If you are interested in design, check this stuff out—you may get a lot more out of it than expected, without doing much more than participating in a conversation. “Design is everywhere, but when it’s good, you don’t really notice it,” Killian says. “Come to Design Week just to see what it is all about.” You can learn more about AIGA through their website saltlakecity.aiga.org. “When I’m working and concepting [at Adobe], it’s the same thing as when I’m doing bowls. I lose track of time,” says Alan Peck. He believes that his career as a graphic designer works harmoniously with his side hustle: hand-making wooden bowls, peppermills and rolling pins. “Time and space cease to exist, and I’m just in that moment of making something and coming up with different ideas.The tools are different, but it’s almost the same thing.” For Peck, “making” has always been a part of his life, whether it be painting, drawing, photography, pottery or woodworking, so design naturally fell into place for him as a student at Utah State University, when a professor convinced him to change his major from illustration to advertising design, opening up the possibilities for Peck. The garage of Peck’s Midvale home is fully equiped with two laithes, a larger laithe he favors for turning bowls and a smaller one suited for peppermills and rolling pins. Stacks of bowls line the shelves, meticulously marked with the dates they were created, while newer pieces wait in plastic bags. 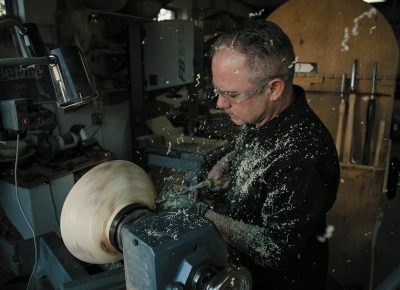 There is an intricate, dramatic element to each bowl that Peck hand-makes—lines that look like rivers and roads on a map snaking over the impossibly smooth wooden surfaces, something that Peck says is caused by fungi surrounding and killing other fungi in the wood. “It’s like warfare, really fascinating,” he says. This happens only after allowing the freshly turned bowls, damp from the process, to soak in the moisture in plastic bags for about a year, before being taken out to dry. Mon–Sat: 11 a.m.–9 p.m. closed 3:30 p.m.–5 p.m. The eatery is simple. The small space is suited well for its walk-up counter order and row of bar stools overlooking the food-prep area, with a view of Regent Street. Gorgeous-weathered days offer a nice outdoor-patio dine-in option, though it is suited well for takeout and/or catering an office lunch. With my meal served on a silver lunch tray, I can’t help feeling like I am back in junior high watching the white outfitted lunch crew at work. 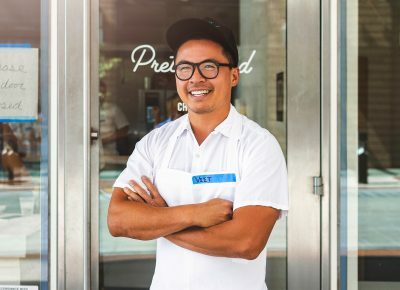 The setting is stark with crisp white lines, with a large neon sign expressing, “Pretty Bird, hot chicken,” which adds that nostalgic, hot-lunch-style feeling. It’s quaint, which means the space is small, though outside, there are picnic style tables and benches that allow for dining up close to the potted plants. The simplicity of the menu pays homage to great Southern fried chicken, which is a staple in the Southeastern part of the United States. The eatery has surpassed the mark of greatness. The gentle spice of the mild and medium blends can be easily quenched by PBR or wine in a can. The all-American vibe complements the branding and style. It’s fast, easy, on-the-go dining, all while enjoying simple pleasures. It’s a stroke of genius, really. I wanted to try the rosé in a can, a house rosé with bubbles, however they were out. Opting instead for the PBR, my friend and me are still overwhelmingly in cluck heaven and are easily convinced that Pretty Bird should be a weekly staple. I’m looking forward to returning soon and sorting out which wine in a can will be available this fall. Oh, and one more thing, their website suggests that they occasionally sell out, so if you have a late-night craving, you might be out of luck—oh, cluck!